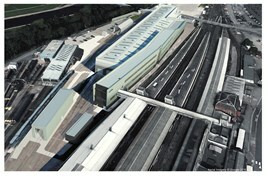 Plans for a new rail depot at Exeter have been submitted today (February 24) by Network Rail on behalf of Great Western Railway. If approved, construction on the facility would begin in spring 2018, and would be finished in mid-2019. The operator says the depot is needed to accommodate an increase in fleet size in the region. The new depot is situated alongside existing facilities next to Exeter St Davids station, and will provide enhanced modern servicing, cleaning and maintenance facilities necessary to support these trains. The plans include office and welfare facilities for staff. This reinforcement of Exeter as the base for the local train fleet makes it all the more urgent to re-establish a second rail link westwards, to prevent the isolation and reduce the disruption when the coastal route is severed by storms. And what's the future for the derelict but fairly modern train depot just outside Bristol Temple Meads? Does this mean that Laira Depot will be downgraded?